You may be surprised to learn that Adria built its first caravan way back in 1965. And now, 50 years and some half a million tourers later, the Slovenian firm is hanging out the bunting and chilling the bubbly in a public celebration of this not-inconsiderable achievement. We've already reviewed one of the two ‘Silver Collection’ caravans Adria is producing for the 2016 season, the new Altea Eden, but there’s a bigger and more couple-oriented model in the line-up, too. And it’s based on the existing Isonzo. Like the Eden, the Isonzo gets a serious makeover, with the stylish iShape body swathed in silver and kit levels ramped up with alloy wheels, a microwave oven and Alde heating. All very impressive, but surely that little lot’s going to ramp up the costs, too? Not so. A standard Isonzo costs £18,390, so with the Silver Collection’s extra kit you might expect an RRP of around £22,600. In fact, it costs £19,390 – just £1000 more than a standard model. The special edition also benefits from the new kitchen treatment all Adoras get for 2016, which includes a bigger fridge and a repositioned oven. And to see other Adria caravans for sale, click here. Manufacturer special editions (as opposed to dealer specials) are an increasingly rare sight on the UK market, so the Isonzo Silver Collection is quite an event. It certainly looks the business. Adria’s ‘iShape’ styling has always looked good, but now it’s a stunner thanks to silver sidewalls set off by darker grey front and rear panels and contrasting side skirts and wheelarches. The panoramic rooflight remains, too, and the alloy wheels are new: it’s a premium-looking caravan. The angled forward corner steady winder bolts are as tricky to reach as ever, sadly, despite the long guide tubes, but the rears are fine – and you won’t hear us complaining about the heavy-duty legs, either. Other things we like are that the entrance door is on the UK side, with the services ranked along the offside wall. It’s not exactly a flyweight, however. At well over 8m long and with an MTPLM of 1750kg, your tow car will need to weigh at least 2059kg if you’re a stickler for fully laden 85% matches, and you’ll need it to pitch the van. Adria has left the Adora’s lounge pretty much as it was the previous year. And having run a long-term Rhine on our fleet for several months, we’re happy about that. One thing that has changed is the seat-base material. Gone is the rather flimsy plywood that was prone – in the case of our example, at any rate – to failure; the latest models get sprung bases, and that makes a world of difference in perceived quality and comfort by day and night. Elsewhere, Isonzo 2016 is pretty much as per Isonzo 2015. And that means neutral soft furnishings with contrasting dark curtains, thick, comfortable seat squabs and a U-shaped seating arrangement that, in the absence of the central chest of drawers (the Isonzo has a small folding shelf ), feels uncommonly spacious. You could seat seven or eight people – either for lounging or dining – with ease. The ambience in here is as pleasing as ever, too. It always feels beautifully lit, thanks to the large, deep front windows and the standard-fit opening panoramic rooflight. After-hours lighting is good, too – the usual adjustable reading lights are aided and abetted by three powerful halogen downlighters just aft of the big rooflight. Moving into the kitchen and this area has long been one of Adria’s strengths. The gigantic drawers have been retained for 2016, likewise the generous worktop space and the clever design of unitary hob and sink, which is made in such a way as to drain any pan spills straight into the sink. The hob comprises three gas burners. The big news concerns the cooker. It retains its separate oven and grill, but has been located at a more accessible level below the worktop rather than almost at eye level. The sink cover doubles as a removable chopping board and additional worktop space. Two large roof lockers and a full-height slimline fridge/freezer complete the picture. The Adria Adora Isonzo 613DT Silver Collection's washroom is a full-width affair across the rear of the caravan. It’s a traditional layout, with the toilet directly ahead as you enter (there’s a frosted window behind it), a vanity unit in the centre of the rear wall and the separate shower located on the opposite side in the corner. It has a decent amount of floor space, and the window and rooflight make it seem light. We love the ‘salad bowl’ washbasin, too – as well as looking great, it opens up worktop space around it and holds a lot of water. The shower cubicle is a good size, too, but it features waterproof, lined wallboard rather than a single piece moulded liner, which you might expect in a mid-range caravan. The Isonzo is a four-berth caravan, but we suspect most will treat it as a large two-berther. The main sleeping quarters are towards the rear, where the transverse island bed fills the area between the kitchen and end washroom. There’s ample room to walk around the bed to the washroom beyond and the loo area’s sliding door opens up even more space. Each bed occupant gets a reading light and a small bedside unit for books and spectacles, and the bed itself is a good size, measuring 6ft 5in x 4ft 7in (1.96m x 1.4m). It feels bright and airy in there, too, thanks to the large rooflight, but we are at a loss as to why Adria has fitted a window at the head end of the bed. Yes, it adds to the light, but makes sitting up in bed uncomfortable, especially with the blind drawn. We would prefer a plain wall with a bigger, deeper, padded headboard. The front sofas aren’t long enough to serve as singles, but make up into a large (2.12m x 1.54m) double. Any caravan equipped with a fixed double bed brings with it a huge void beneath and, in the case of the Isonzo, there’s also an exterior access door. Elsewhere, the front bedding lockers are split between boiler/electrical equipment and useful empty storage space, while the kitchen boasts those huge drawers, together with a large wardrobe opposite. There are roof lockers galore and the washroom offers additional storage space beneath the basin. Certainly, for two people, the Isonzo’s available space is more than up to snuff, although families might stretch it on longer holidays. 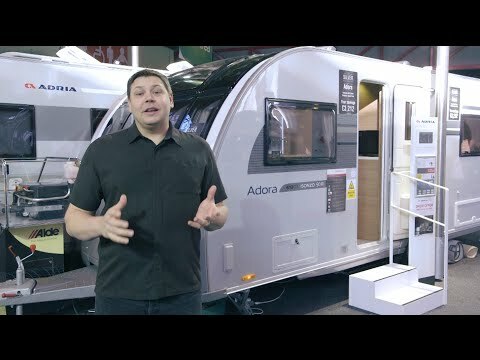 It’s very easy to view any special edition caravan with a degree of cynicism, but in the case of the Adria Adora Isonzo 613DT Silver Collection, the additional benefits are there for all to see. The silver exterior looks stylish and premium, and there’s no arguing with the additional kit on offer at this sort of price point.